This is an interesting book, we haven’t totally evaluated it yet. However, it seems to have lots of controversial information. MGA wrote about the child-marriage of Aisha and many other related topics. 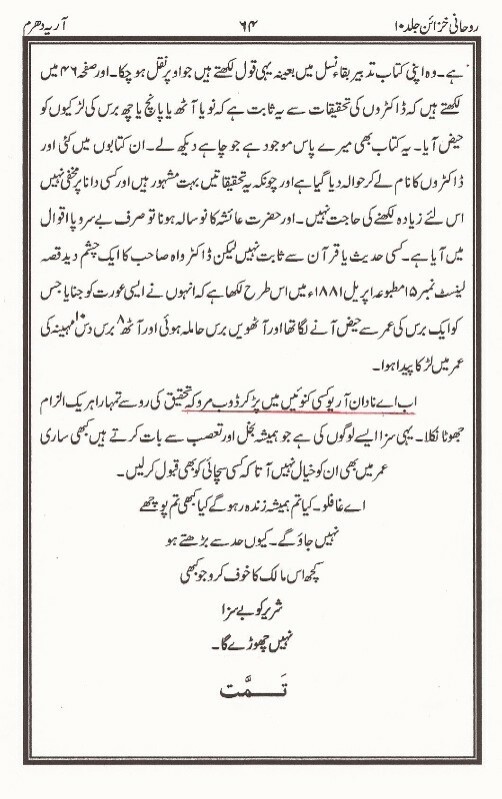 The Arya Samaj hindus seem to have written an analysis of the marriages of Muhammad (saw). MGA and his team responded with “The Arya Religion” (1895). The second edition of this book was published in 1903. This was a small part in the overall beef that MGA started with the Arya Samaj in the early 1880’s. Lekh Ram came soon thereafter. In this book, MGA complained that his God and prophet were being unnecessarily ridiculed and it should be against the law, however, MGA himself insulted the God of Christians in this very, in fact, he used Hindu writings vs. Jesus Christ as he called him a drunkard and a fornicator. In this book, MGA seems to have endorsed the concept of Nikah-Muta and abrogation. O stupid Aryas go into some well and drown to death. “Ab aey naadaan Ariyo kisi kuwain mein parr kar ddoob marro”. their wife is the wife of everyoneWah wah! What a religion! what a faith! My My! What religion! what a faith! “”””If the Christian missionaries would listen to me I would counsel them to refrain from raising objections which can be directed against their own scriptures also. For instance, one of their principal criticisms of the Holy Prophetsa is directed against the battles that he had to wage under Divine command against those disbelievers who persecuted him and his companions for thirteen years at Makkah and inflicted every kind of torment upon them, and then devised a project of killing the Holy Prophetsa himself, so that he and his companions were compelled to leave Makkah. But his persecutors did not desist even then. They pursued him and treated him with every type of impertinence and continued to proclaim him false. They subjected the weak ones from among the Muslims who had been left in Makkah to extreme torment. Thus in the estimation of God Almighty, on account of their tyrannical behaviour, they became deserving of chastisement according to the eternal law of God. This chastisement was earned also by those who had helped the Makkahns in their misconduct and by those who had on their own carried the torment of the Muslims and the ridicule of their faith to the extreme and used all their power to block the propagation of Islam. Thus those who drew their swords against Islam were destroyed by the sword on account of their wickedness. Then is it fair to object to this kind of fighting, forgetting the battles of Moses and other Prophets of Israel in which thousands upon thousands of suckling babies were slaughtered? Such objections result from a spirit of mischief and deceit and disorderliness. First is the Holy Qur’an. It should, however, be remem­bered that only that interpretation of a verse of the Qur’an is correct and trustworthy which is testified to by other verses of the Qur’an, inasmuch as some verses of the Qur’an interpret other verses. If certainty of meaning should not be guaranteed by other verses of the Qur’an, then the meaning should be confirmed by some true and reliable Hadith. According to us, the interpretation based merely on one’s opinion is not permissible. Everyone who raises an objection against the Holy Qur’an should keep this rule in mind.